Pain is the body’s way of telling us that something is wrong. When the pain lasts more than three to six months it is called chronic pain. Chronic Pain Syndrome (CPS) is difficult to treat and can include symptoms beyond pain, like anxiety or depression, that affect daily lives and ability to function normally. Counseling, physical therapy, and relaxation techniques are part of the treatment plan. Michael James Hastings – also known as Captain Mike on the TV series The West Wing. He was diagnosed with Fibromyalgia at age 30. He strongly promotes awareness and has donated millions to organizations working towards finding a cure. Sinead O’Connor – singer, took three years off from performing in 2003 to deal with Fibromyalgia and spend time with her children. Morgan Freeman – known for his performances in The Dark Knight and Shawshank Redemption, is a vocal spokesperson in the battle against Fibromyalgia. Rosie Hamlin – singer with Rosie and the Originals. The group is known for the hit song “Angel Baby.” Hamlin stopped performing in 2005 because of her advanced Fibromyalgia. She passed on March 30, 2017, at age 71. Severe pain is the primary symptom and lasts more than three to six months. A syndrome is defined as a set of symptoms with no known cause. These pain syndromes are being put into the category of diseases because of the nature of the illnesses. Fibromyalgia is when pain signals are improperly or abnormally translated by the brain resulting in severe nerve pain felt under the skin. Myofascial Pain Syndrome (MPS) is when repetitive stimuli cause deep pain in muscle tissue fibers. MPS usually precedes the onset of Fibromyalgia. 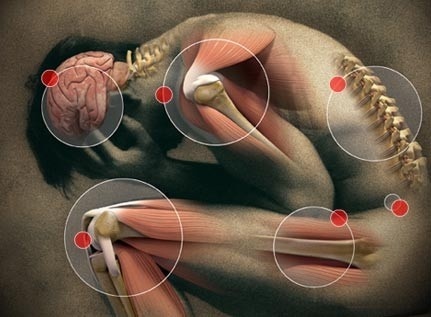 Lowering MPS pain can also calm Fibromyalgia pain. Healthy diet with many fruits and vegetables.